Have you ever wondered what a falcon sounds like as it flies past your face at 60+ MPH or what a hawk’s breath smells like? 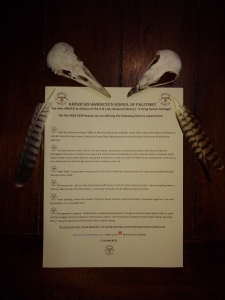 Check out our falconry school brochure and book a class with us today! Click on the events Button on our Home page for booking information. We are located at holiday Valley Ski Resort in Ellicottville NY.